Last weekend we ventured over to a foster cat home in Oakland where we met a clutter of kittens looking for dominions to rule with servants. Mr. K and I stepped up to the plate, offering our humble abode and services. We were adopted by two young cats, who were rescued together in Oakland by the ICRA (Island Cat Resources and Adoption), a group of volunteers dedicated to reducing the suffering of abandoned and feral (wild) cats. Afterwards, we got into our car, hungry and thrilled – cats to be delivered to our home later. Fortunately, we were less than a mile away from Bellanico in the Glenvew area, where we enjoyed a nice dinner a while back. A quick search online showed that they are open for brunch on the weekends. Excellent news, as I had a Blackboard Eats discount to boot. 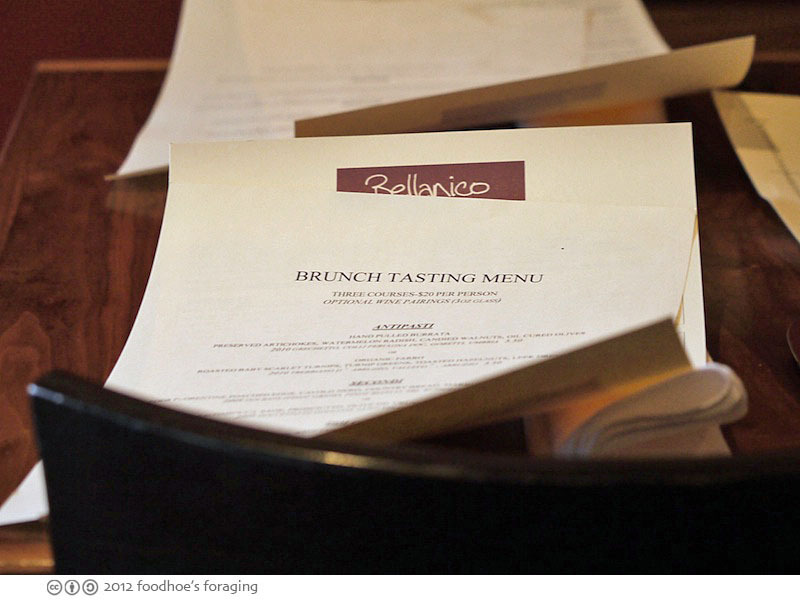 The brunch menu offers intriguing and rustic Italian dishes that change seasonally. It includes savory antipasti, hash made from duck confit, a pork belly panini with fried egg, pastas and even short ribs and roasted char as a lunch course. I couldn’t resist ordering the 3 course brunch tasting menu. We were the first customers to walk in, but the cozy table in the front window was already reserved, so we sat up in the front area which felt bright and airy from the windows. The restaurant soon bustling and I must say that I’m glad we had the paper to read as the sound levels were incredible, conversation was fairly impossible with the tumultuous roar of happy diners amped up on caffeine and mimosas. We shared the first course of hand pulled Burrata which was served with thinly sliced crostini to spread on, preserved arthichokes, thin slices of watermelon radish, a handful of candied walnuts and chewy oil cured olives. The composition was lovely and the flavors inflamed our hungry tastebuds. 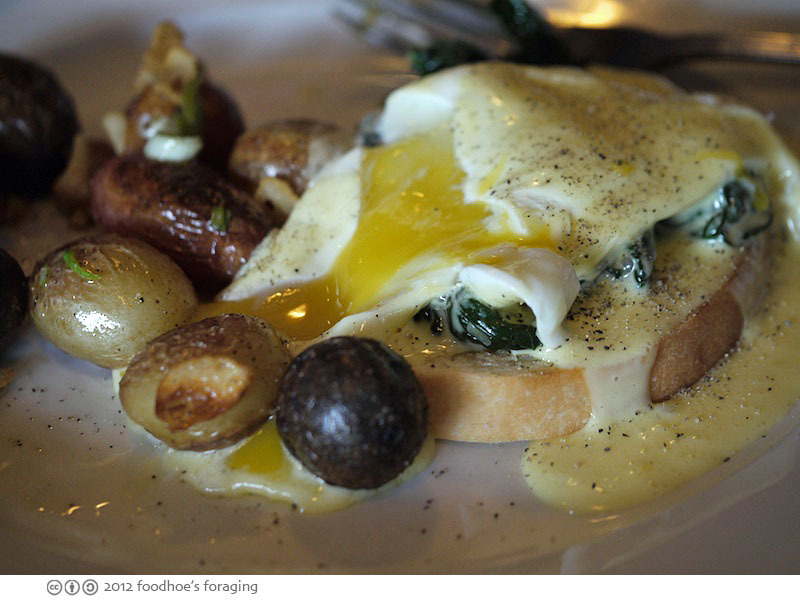 My entree was a decadent Eggs Florentine, two poached eggs served over chewy cavolo nero (a black leaf kale from Italy, a leafy cabbage with deep greenish black leaves), on top of a slice of grilled country bread and then drenched with rich lemony hollandaise sauce. 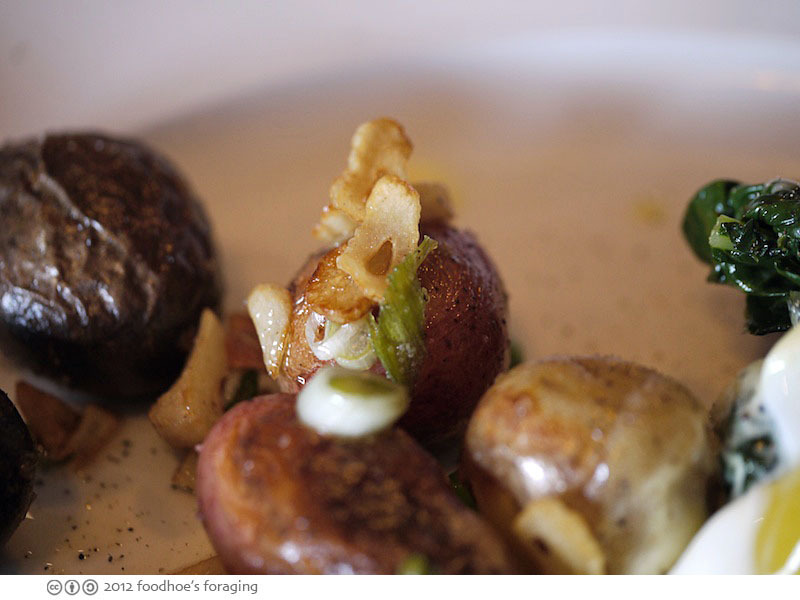 The marble potatoes were tiny and very flavorful, sautéed with aromatic slices of fried garlic and green onion. 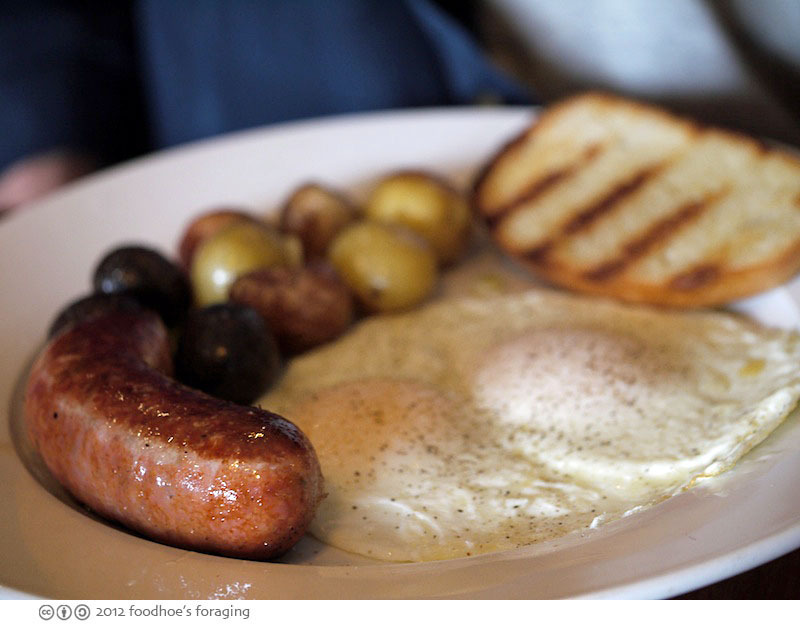 Mr. K enjoyed the two eggs over easy and sausage ($10), which included the delectable marble potatoes and a plump Italian sausage which had a delicate texture that was more hot dog than sausage, but had a good snap and was juicy and savory from fennel seeds and other spices. It was served with grilled country bread. Strangely, they told Mr. K that they did not have dijon mustard for his taters and brought him some home made jam for his toast instead. I admit that I really ordered the tasting menu so that I could have this dish along with breakfast! 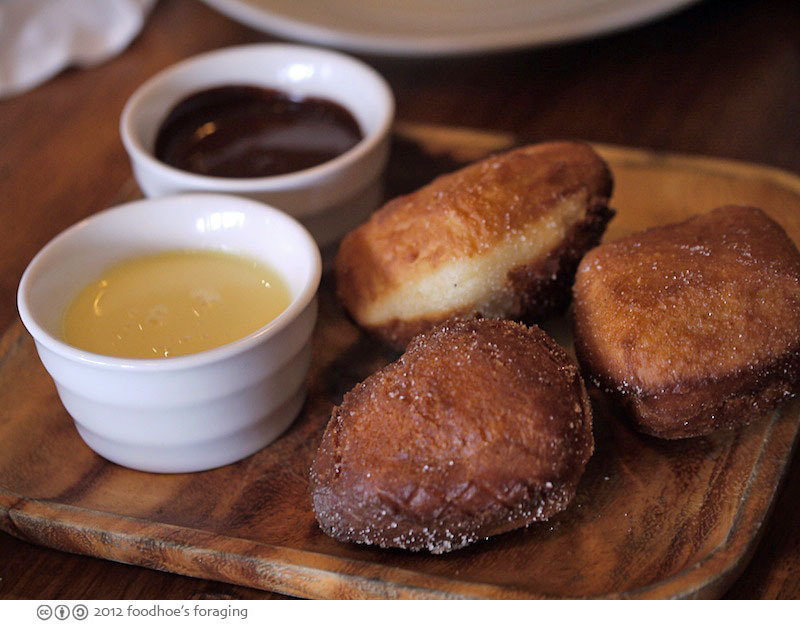 Bomboloni, which are Florentine doughnuts, served with sage custard and bittersweet chocolate dipping sauces. The doughnuts were very tender and moist inside, with a cakelike crumb and crunchy crust that was lightly crusted with sugar. 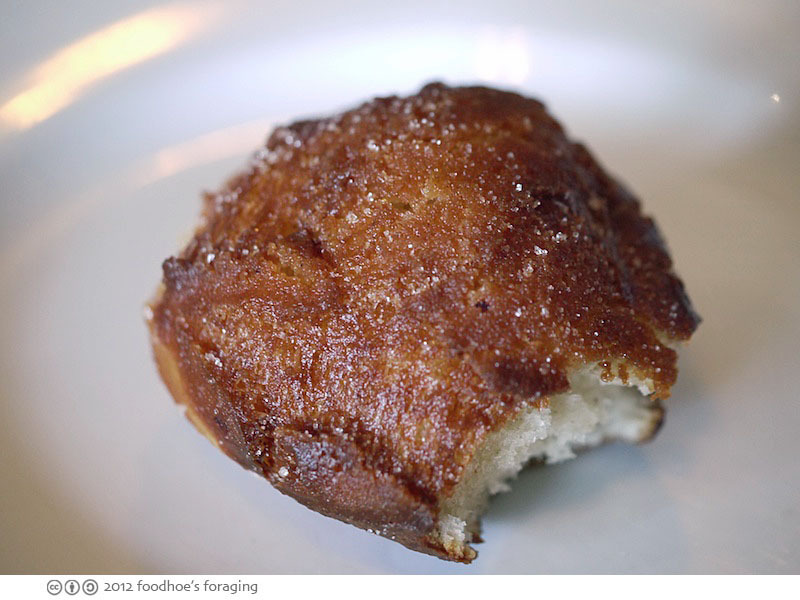 I liked it best with the sage custard and dunked into coffee… yes I am a philistine when it comes to donuts! 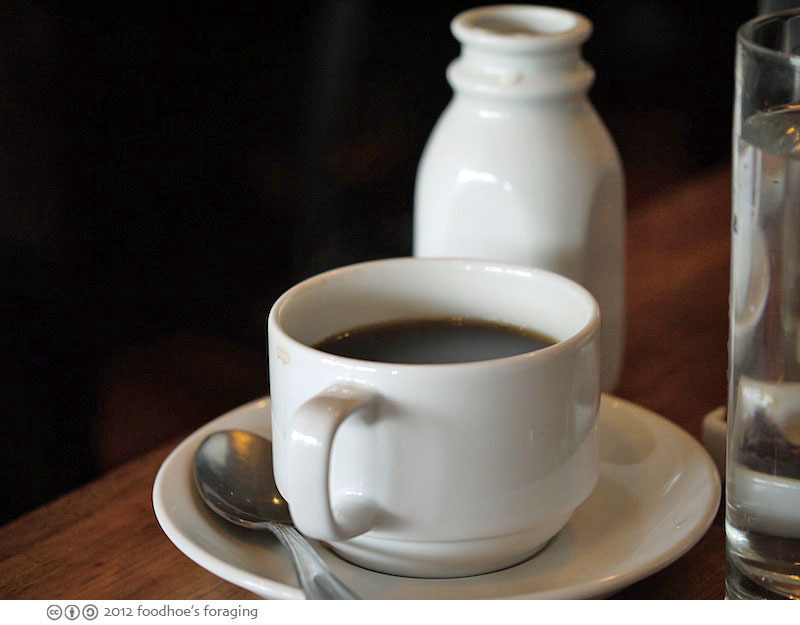 The coffee was very good, the cream came in a cute little ceramic milk bottle. I drank too many cups of coffee and contributed to the general cacophony. It was a delicious, restorative meal filled with happy anticipation. 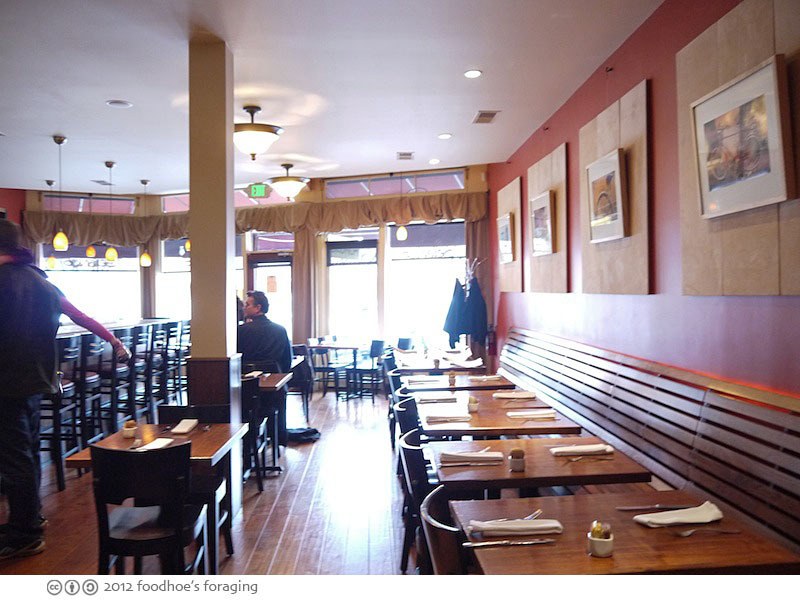 We just wish this was walking distance and in our neighborhood, but it is only a short drive down the 580 and will definitely be added into the weekend brunch rotation. The food looks lovely! 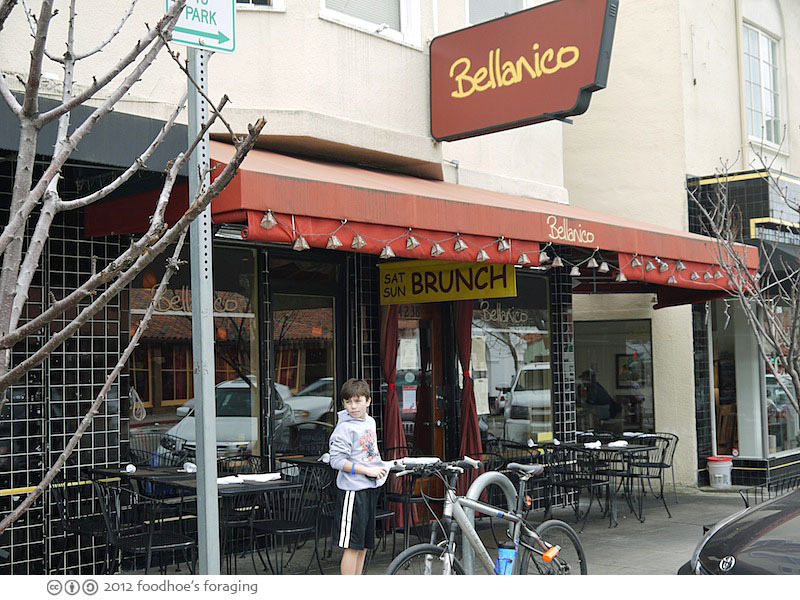 We haven’t tried Bellanico yet, in part because the menu has always seemed very meat-centric. What is it with restaurants and sound levels? We just had lunch with a friend at Noodle Theory on Claremont at College, and it’s a small place, but was plenty loud. I guess people design spaces for function and looks, not for controlling sound levels. Can’t wait to see photos of the new kitties! Just want to say that I am so tired of noisy restaurants. I like eating and I like talking, and it’s nice to do them simultaneously. Hard to find places now that aren’t insanely loud…It gives me a stomach ache! Welcome back!! That place looks fun, too bad it’s a bit out of my bus routes to check out. Maybe one day when I get my hands behind some wheels. The bombolini looks great. Have fun with your new kitties! awww, thanks Ben. It is a little off the beaten track, but there are quite a few good looking spots over there. I’ve been having so much fun with my new kitties! Those donuts look incredible! I definitely need one of those to wake me up on a regular basis! Sounds like a fantastic spot. 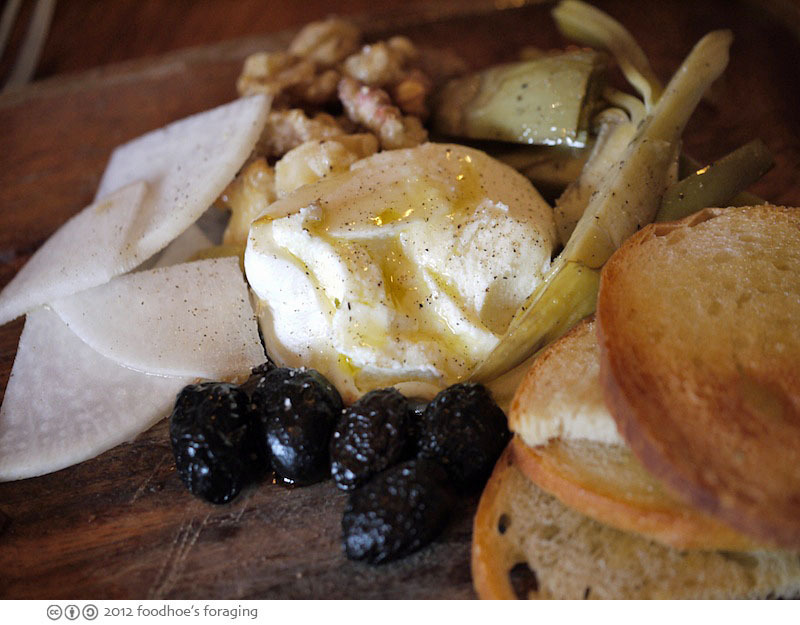 You pretty much had me at burrata, though…I couldn’t say for sure what followed that because I went off into a hungry, dreamy little trance. Mourning a loved pet is the worst. My heart truly goes out to you. I LOVE that you are adopting some new kitties that need a home, though–in my experience, getting Sophie was the only thing that truly healed our grief over losing Frances. Hugs to you! hungry dog, it is really hard to move on, and I feel traitorous at times, but I agree it is good to give these kittens a home. Now that we have all accepted each other (including our existing older cat Ika) we are all feeling better about the world. Damn this restaurant is marvelous !! I mean…the food is so delicious !! Seriously ! !